Price $109.00 minus $10.00 coupon in the cart, so only $99.00! 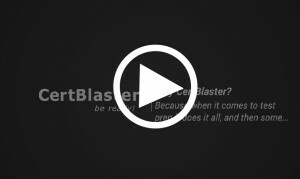 The CertBlaster® 70-411 practice test helps you prepare for Microsoft’s 70-411 Administering Windows Server 2012 exam. With over 150 practice questions similar to the ones on the actual exam, this is an exceptionally comprehensive and complete practice test offering. What is Included in the 7-411 Practice Tests? 3 Full A+ Exam Simulations – Same number of questions and same timer as the actual exam – Like taking the exam in the comfort of your home! 6 Focus Drills – Each Drill corresponds to one of the six Microsoft main knowledge domains for these exams – So you can focus on the areas you need to work the most on. 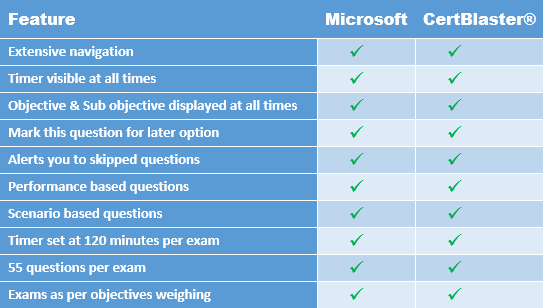 Gives you an overall grade and grades per exam objective. Because we have exfeptionally comprehensive 70-411 practice tests: 158 questions! Because you get 3 complete exam simulations plus 6 Domain Drills (one for each exam objective). This is the Certblaster configuration you get for the MCSA Server 2012 suite of practice tests. This exam is part one of a series of three exams that test the skills and knowledge necessary to implement a core Windows Server 2012 infrastructure in an existing enterprise environment. Passing this exam validates a candidate’s ability to implement and configure Windows Server 2012 core services, such as Active Directory and the networking services. The Microsoft Certified Solutions Associate (MCSA) Windows Server 2012 credential validates that you have the skills needed to run a highly efficient and modern data center, with expertise in identity management, systems management, virtualization, storage, and networking. Earning an MCSA: Windows Server 2012 certification will qualify you for jobs such as computer support specialist and information security analyst.